Having written about Shell in Nigeria for over fifteen years, we have known that there was huge internal disquiet about the company’s operations in the country. In the aftermath of the murder of Nigerian writer Ken Saro-Wiwa in 1995, Shell was pilloried in the international press for being complicit in his death and for being an integral part of the vortex of violence tearing the Niger Delta apart. Amidst the criticism, the company has always tried to keep its employees on side. The morning after Ken’s murder a letter was on the desk of every Shell employee telling them how Shell was not to blame for his death. Over a decade may have passed, but Shell has not managed to extricate itself from the violence of the Niger Delta. And finally the internal tension of Shell’s Nigerian problem has, it seems, gone public. Late last week a letter was supposedly leaked from 116 employees from Shell’s core countries: The UK, The Netherlands, and the US and sent to various environmental groups. It was then sent to the Financial Times. What has made the headlines is that fact that the letter was leaked with all the email contacts of Shell’s 170,000 staff. The actual content of the letter has been glossed over in the furore over data protection. If the remarkable letter is genuine and I stress we do not know if it is yet, it is truly remarkable. “From as recently as 1999 to today, more than 20 communities have been wiped out completely and more than 50,000 people killed in the Niger Delta by a Shell-sponsored military,” they say. • and waste from Shell’s production revenues to the government. 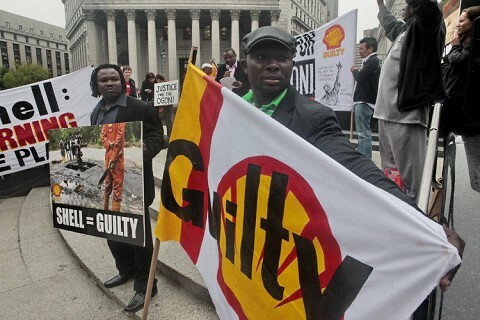 There is nothing new about these accusations – NGOs have been levelling them at Shell since the early nineties. But what is new is that the criticism is coming from within not from outside. Finally the internal disquiet has become external disquiet. Take one of the most emotive subjects: gas flaring. A whole plethora of Nigerian communities and environmental groups have been arguing for years to switch off the flares. But Shell has refused to do so. But according to the employees: “The best solution with regards to gas flaring is to enforce an immediate end to gas flaring and an end to exploration and new oil field development until Shell constructs appropriate facilities for the utilization of all associated gas”. Shell employees calling for an immediate end to gas flaring – this is a big step forward. They argue that “the only way to have real, meaningful change within Shell is to launch and sustain a peaceful Royal Dutch Shell Corporate Revolution”, that includes a public boycott of Shell’s products, and investor disinvestment. Meanwhile Shell said that it does not believe the letter is genuine. We may never know if it is genuine, but if it is, it shows the level of concern inside Shell. Unless you have a pipeline to carry the gas elsewhere for use and an industrial base to use it there is nothing else to do with the gas. If it was liquified it would incur transportation costs and would be shipped to where? So flaring is the way to get rid of the gas. It is done in Alaska USA for the same reason. I would be pretty suspicious of the letter being a fake. Gas flaring is a process for getting rid of natural gas so that it does not accumulate and become dangerous not sure why you want that ended? I agree with Mr. Forester. The experts within Shell would not be so cowardous as to link a lettre! It screams activists to me. As for the Ogoni issue involving MOSOP president Ken Saro-Wawi Shell did not just deliver a lettre to its employees saying they had nothing to do with it. The subject has been widely refered to in world press and it is publicly known Shell sent a lettre to the Nigerian Federal Government pleading for the case of Mr. Saro-Wawi. Furthermore no Shell employees were involved in the trial or even alowed to, so Shell did the best it could to prevent these terrible events from occurring.